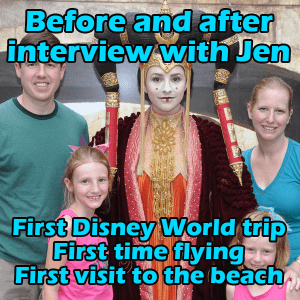 Today is another interview with a first-time Disney World visitor named Jen who just returned from a 10 day trip to Disney World that was full of firsts for her family. Hear what she planned, how she fit in a trip to the beach, what her husband said when he realized how much planning she'd done and see if her plans had to change once she got there. I also have a quick tip of the day about choosing restaurants during your trip. Jen discusses her post-Memorial Day trip with her family where they stayed at Port Orleans Riverside in a Preferred Room. Jen mentioned planning to watch a movie at her resort. Check the recreation schedule at your resort if you'd like to do that on your trip. When choosing where to eat, definitely consider eating at your Disney resort, especially if you're staying at a Deluxe or Moderate Resort. 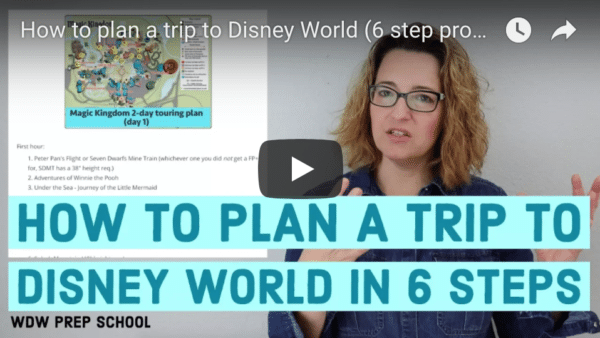 Do you have any questions or additional thoughts on Jen's trip or planning your own trip? Feel free to leave it in the comments. I love these real-person insights, especially because your 6yo is the same age my daughter will be by our trip. I’ve wondered what rides to mentally prepare her for in case there are scary elements, so good to know about Pirates. You also mentioned the stroller for her. I’ve really struggled with whether or not to take one. She hasn’t been in a stroller in the rest of life for almost 2 years now, but this is an exception kind of thing. She’s recently taken up jogging with me too, so I’m not sure if this conditioning may help her. But people say you carry all your stuff in it so it’s good to have. We also do NOT have a preferred room in POR because we need a 5 person room which is only available in Alligator Bayou. Any insight on the stroller situation is appreciated. Did you just order the stroller in the park that day or are they available via the resort? If we do need one, I’m thinking not traveling with it on the plane would be nice. You can get a Preferred Room in Alligator Bayou. You might consider renting one of Disney’s strollers in the parks as needed. I love these trip reviews, and your podcasts in general. It sounds like you had a great trip Jen, and thanks for sharing your family with us. I did laugh when you mentioned that Clearwater wasn’t that far away because you live in the middle of Nebraska and everything is a few hours away. I also live in the middle of Nebraska and can so relate! I’ve been to WDW a few times before, but have always stayed offsite. This next trip we are staying onsite, and probably at POR. I’m always interested in how the transportation works, because even though it’s not my first trip to WDW, the transportation thing is completely new to me! Thanks so much! Loving your podcats and hints via e-mail! We are first timers as well and going in October (I don’t count 35 yrs ago). Your info has been so helpful! We have felt very overwhlemed but with the guidance I think we have an awesome trip planned inc. a surpsrise scuba dive for the hubby! I loved this interview! Before and afters are so fun and interesting to hear about. I’m glad they all liked the Hoop Dee Doo, and I would love to check that out on my next trip. Was it hard to get there from the resort? The Star Wars events at HS sound like a blast! What a great trip….enjoyed hearing about it. We chose to take the bus from Riverside over to Magic Kingdom and then take the boat over to the Hoop Dee Doo Review. It was our original plan based on a friends recommendation but we also asked a cast member and he told it that would be our shortest route. We planned an hour for transportation and it worked out well. Cool! That sounds like a good plan. Thank you! Hi Shannon! My question may be a little random on this post, but I just listened to this one this morning. I love your podcasts, they’re very helpful. Even to a former cast member like myself (: I am planning a trip for September 2014 with my boyfriend. We’re doing the Wild Africa Trek. I know in the past, you were able to add other photopass pictures to the ID they give you from the tour and get them all for free with the tour price. Is this still true with Memory Maker? Yeah, I think and hope so as we are doing the Wild Africa Trek in October. Shannon – did it work this way? If we do Wild Africa Trek – and all photos from the Trek are included in your Trek price — do they give you a photo pass card – that you can use the rest of the day in AK and have those photos free also? Can you take that to another park on a different day following and also use it – and get those photos with your free ones from the Trek?? I like how you included a family that also did other things on their trip. We always spend some time in the Tampa/Clearwater area around our Disney trips visiting relatives and going to the beach. In the past, we have spent about 5 days at the beach and 2 or 3 days in WDW. This year we are spending equal time at WDW – we arrive late on day 1 in Tampa/Clearwater; then we’ll spend 2 days at the beach, 5 days at WDW, and then another 2 days at the beach to relax after our touring. On the third day after we return from WDW, we will be leaving later, so we can take our time packing and heading home. I hope everyone plans a little down time on their vacation because it’s necessary, in my opinion, even if you don’t leave the WDW bubble. There are plenty of things to do that are relaxing – like staying at your resort for the day, enjoying the pool, play areas, and taking a nap. 🙂 Also, most resorts have outdoor movies playing in the evening, weather permitting. Yay! So glad they had a great trip! Thanks for all you do to help people with their planning – I will always send my friends here first!